In order to reach young, new users through social media, we created a short movie proposing a luxurious weekend of glamping in a Lexus SUV. Through a branding video showcasing the premium world of glamping, as well as time-lapse recipe videos sponsored by Lexus shot locally, we organically showcased the Lexus RX as an alluring vehicle for an adventure. The short movie does not promote Lexus as a luxury vehicle; rather, the car is a platform for an active lifestyle revolving around it, while further depicting what “lies beyond a ride in a Lexus.” The branding video targets consumers who are already familiar with the Lexus brand. For the direction of the piece we utilized a rich video format ideal for both television and website viewing. Contrastingly, the time-lapse recipe videos were created for consumers who do not yet have a strong interest in the Lexus, in particular those who often browse the web on their smartphones. The videos allowed us to strategize on how to best reach potential Lexus consumers. The video did not simply focus on the food itself, but functioned as a way for viewers to visualize what they can make on their own outdoor excursions, and to promote a stylish lifestyle that can be enjoyed through glamping. Although the core objective of the time-lapse recipe videos was the same as the Lexus branding movie, the food videos were more strongly adapted for smartphone viewing, to target audiences who admire the kind of lifestyle that can be enjoyed with Lexus. Lexus glamping: A luxurious way to spend the weekend. A luxurious way to spend the weekend. 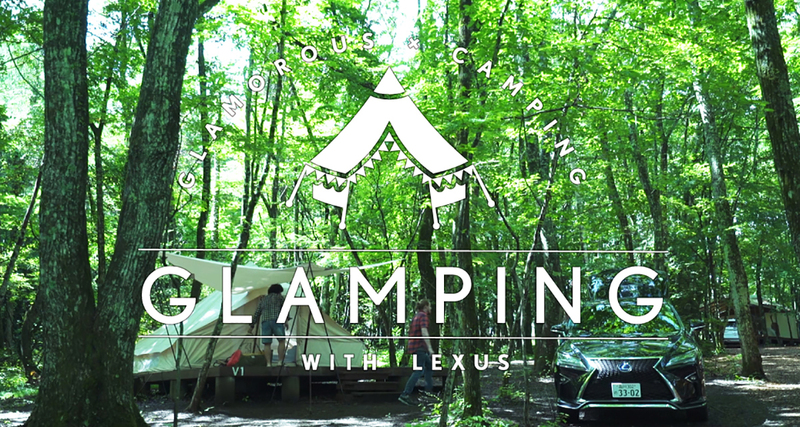 What is LEXUS Glamping?